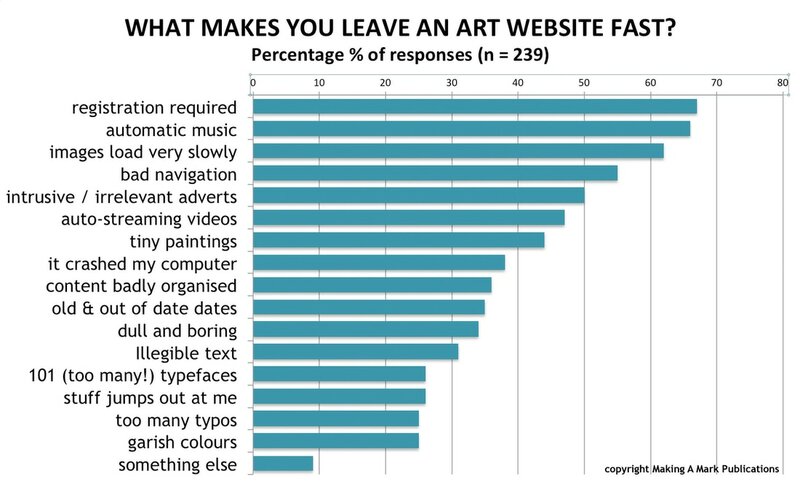 There has never been a better time for artists to build their on websites using webware which is very easy to use - and involved absolutely no coding. However you still need to understand some of the basics of website design. At the end of this page, I will be developing links to further reading. Unless otherwise indicated the links are to posts on my blog where I've written extensively on this topic. make sure all hyperlinks are colour coded - don't leave people guessing. Are your sites mobile friendly - or are you facing Mobilegeddon? - A technical change by Google means that all sites which are mobile compatible will get an uplift in search rankings. This post reviews looks at how Google will encourage more sites on the internet to become mobile friendly - and why it's important to us all. A key indicator of a contemporary template is that it works with recent versions of every browser. It's now essential that websites are designed to be compatible with every commonly used browser - including and especially ones that are specifically designed to be used with mobile devices. You don't need to worry about the older versions. You do need to worry about all the updates and new versions! If somebody asks me to take a look at their new website (and I only do this for free for friends!) I always make sure that I look at it on my iMac, Mini iPad and my iPhone (e.g. see Brand new website raises design standard for art societies) and I use different browsers to do this. How long does it take for your page to appear? Speed on an image-based website is largely determined by file size (based on resolution, actual dimensions and file type). To keep your website fast you need to make sure you don't make images any bigger than they need to be. You can also test how fast your website is. Use Google PageSpeed Insights Tool to check how fast your website loads - Do you know how well your website or blog renders on a mobile device or a normal computer? This website tool from Pingdom allows you to test how fast your website page loads. Note you do NOT get unlimited free tests every month. How your website ranks in response to google searches depends on the quality of the content as well as the number of people who follow an artist. You must advise people of what they are buying in terms of presentation and "add ons"
You may have noticed that websites which have had a makeover recently are getting bigger and better images. Images are becoming very prominent on all sorts of sites. ​A contemporary website design for an artist's website should provide a range of ways for displaying images. Image-Focused Design: Is Bigger Better? (September 28, 2014) Large images are visually appealing, but they can harm the overall user experience if they aren't appropriately prioritized. If you want people to but your art, people need to see what they are buying. On the other hand the speed of your website is a major factor in it ranking well. make sure image size is optimised for speed of loading. That basically means nothing higher than 72 dpi. colours will render depending on the screen used to view them. All you can do is make sure you're creating an image that is as close as possible to real colours. The Fold Manifesto: Why the Page Fold Still Matters (February 1, 2015) What appears at the top of the page vs. what’s hidden will always influence the user experience—regardless of screen size. Where is the Fold? - this is a website which shows you where the page fold comes on different sized screens and with different browsers. Note how pages with deep headers with little content lose a lot of opportunity to make an impact - unless your image does it for you! a call to action button e.g. "add to basket"
good quality images - be prepared to provide large images! Below are some suggestions of websites to look at. None of them are perfect but all have something to help us understand what is possible. Brand new website raises design standard for art societies - Has your art society updated its website to cope with mobile devices and changes in the way Google ranks websites? The Mall Galleries has a NEW website - a review of the new Mall Galleries website - highlighting new features and better presentation of information. An overview of the guidelines Google publishes on how it rates website content and value to those searching for information.